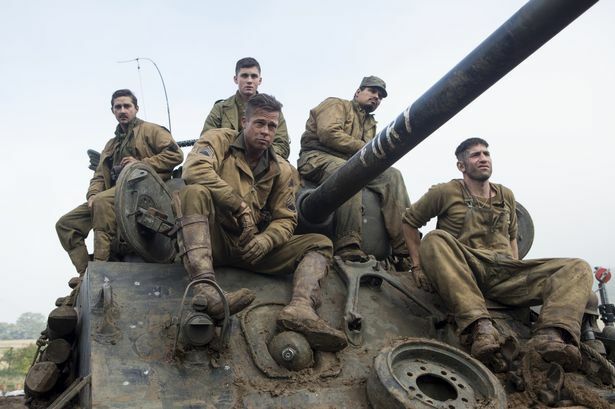 Graham Young reviews new movie Fury, starring Brad Pitt. In any other year, Brad Pitt’s new Second World War tank movie Fury might have been marketed as Hollywood entertainment. But the recent centenary of the beginning of the First World War and the rise of ISIS in the Middle East have been sobering reminders of the human cost of war. And so Fury tries admirably hard to depict true horror with a policy that is shoot to kill – and not shoot to thrill. Writer-director David Ayer’s film is one to be taken seriously, even if the story is ultimately not as emotionally charged as Oscar favourites like Schindler’s List (1993), Saving Private Ryan (1995) and The Pianist (2002). Brad Pitt gives one of the best leading-man performances of his career as Don ‘Wardaddy’ Collier, a Sherman tank commander with a crew which survived North Africa. They are now pushing towards Berlin in Germany, where a desperate Hitler has ordered women and children to join the fight at the tail end of the Second World War. Having lost his assistant driver in battle, the uncompromisingly brave and sometimes nasty Wardaddy is joined by new, wet-behind-the-ears recruit Norman (Logan Lerman). He’s qualified to type at 60 words per minute, not to shoot Nazis. Fellow crew members, acting like characters and not stars, include Grady Travis (Jon Bernthal), Trini Garcia (Michael Peña) and Boyd Swan (Shia LeBeouf, better than usual but still mumbling). The best films make you want to see them again after just half an hour, but Fury’s slow early stages might be hard going second time around. It also takes a lengthy break in mid-section, when Pitt strips to reveal what fine shape he’s in and Norman becomes even more of a man than someone forced to grow up by shooting the enemy in the back. Fury doesn’t fully explain tank logistics or illustrate the bigger Second World War picture, but it shows the unpredictable unfairness of war among the military and civilians alike. Once Wardaddy’s men are cast adrift, the tension mounts towards the final, inevitably bloody, showdown with the advancing SS. The action scenes are heavy duty, visceral and unflinchingly brutal both inside and outside of the tank. All filmed – like Saving Private Ryan – in Britain, where the unrelenting mud is an extra character all of its own.